As you review the track feeders on this blog, please keep in mind that not all ideas will work for all horses. First and foremost, be sure what ever you try is safe for your horses and your facility. Some horses might eat the nets, some might want to destroy them etc. Be sure to check that they can't get tangled up or that the design is not hazardous to the horse. Even small lots can be made into a paddock track. The track is setup on a 1/2 acre around their existing stalls and what used to be grassy area is now an obstacle arena. 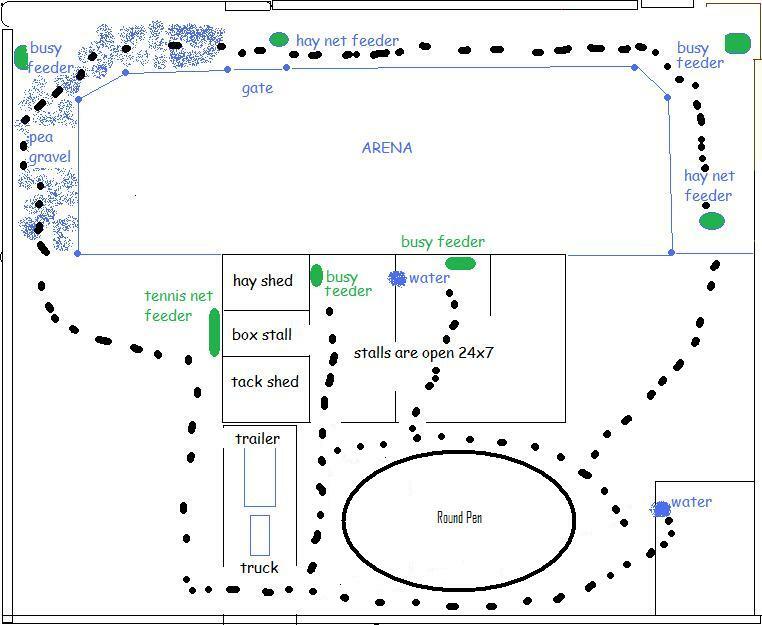 I park my horse trailer on the dirt driveway in a way that extends their walking path around the truck and trailer, around the round pen and back into their stalls. Harley and Lady are out 24x7. The seem to have their routine and pick various places around the track to spend their day when they are taking a break from constant nibbling from the track feeders. Some have asked about the 'dead end' on the right side of the track. I close the track at that end so the horses don't take a shortcut back to the water. They have to walk all the way around the track and over the pea gravel to get to their water. This works from my two horses because they get along well together. It may not be a good idea for horses who don't get along. The width of the track is only about 10 to 12 feet around the arena. Here's the latest from the Browne Horses track system. 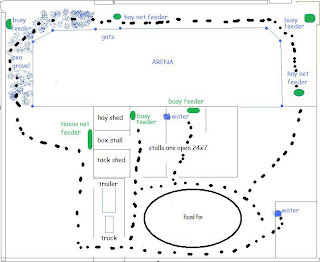 We've setup feeding stations around the track using three different feeders. The BusyHorse Grande bags (2" holes), small mesh hay nets (1 1/2" holes), and home made feeders from my neighbor's tennis court net (1 7/8" holes) they put out for bulk trash pickup. After all the money spent on feed bags and nets, the ones that are working the best are the home made tennis court net feeders. 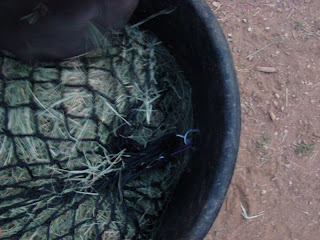 I put a full day's worth of hay out along the track in the feeders you will see in the video. The horses are usually just finishing the hay the next morning. They take naps when they want and 'graze' from the feeders when they want. They are out 24/7. 11/15/08 Update: The feeders you see made from the old used tennis nets started to break down from the constant 'nibbling'. I suppose these nets served their time in the AZ sun. I just turned it over and the net is still holding up well. I found another newer net and it is lasting much longer. Here's the virtual tour as Harley sees it. Here is a photo and short video of the mesh hay net secured to either eye bolts or pipe bolts (I think the eye bolts work better, but hey I used parts I already had :) I have carabiners and double ended snaps to secure the nets. Close ups of the tennis court net feeders. We tried putting pea gravel under it, but it just got mixed up in the the dirt. If I want to spend more money, I can put a rubber mat under it. Here's another idea for the mesh hay nets. I will probably use these when it's raining and I don't feed on the track. These are their original feed barrels inside their stalls under a shade. Nets are secured to eye bolts with carabiners and double ended snaps. Update: I've dismantled the flat rubber mat with the Grande bag at the end of the video. I didn't like the pipe bolts sticking up for them to step on. We took advantage of the inner part of the track system and made a trail obstacle course. Most of the obstacle ideas came from various trail trials and NATRC rides. Here's a slide show of the obstacles from different angles and one of Harley and I working the rope gate. After building the fence line for the mini track system, we put in 10 tons of pea gravel. The horses have to walk over the pea gravel to get to their hay and back again to get to their water. The pea gravel helps stimulate and support the back of their feet. I've seen it also help them naturally exfoliate the dead sole material when it's ready to come off. As as you can see from the video, Harley loves to roll in it. We just put up the hot wire fencing Wednesday, May 7. The horse's love it. We scatter hay around the track and they move around more now. It is such a small area, but more movement is better than none :) They have to walk out of the track and to the farthest corner stall now for water. Next phase will be to put some pea gravel in east section along the Pyracanthas. I caught Harley on video cantering around the track to get to his share of the hay. Lady was blocking him coming from the other direction, so he turned around and entered on the east side and cantered to his food :) More movement. Video and more photos below. My animals are my kids. Harley and Lady (my two Missouri Fox Trotter horses), Kauli my Border Collie and Sassy my English Springer Spaniel. Other Interests: distance riding, barefoot trimming, yoga, sailing, and listening to music.